Denmark has firmly established its reputation as the happiest country in the world, ranked consistently on top of indices from the World Map of Happiness, to the most recent World Happiness Report 2013. 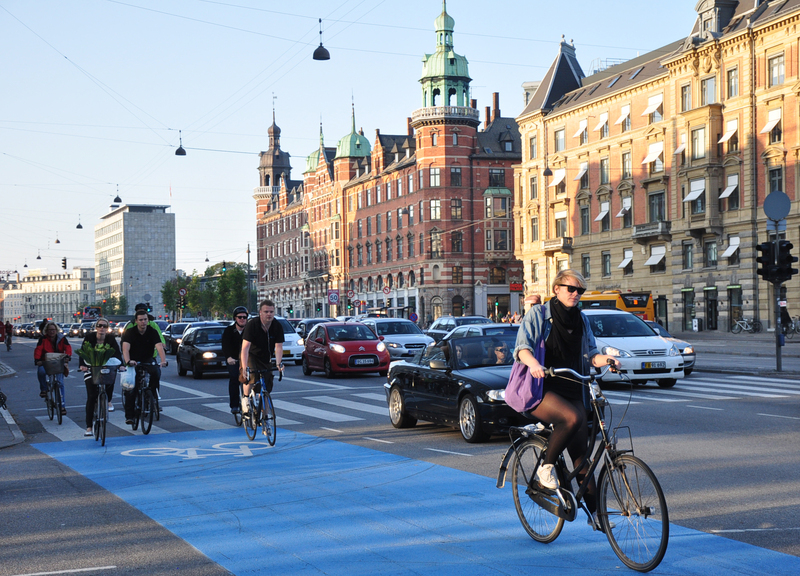 Those passionate about urban bicycling know Denmark as the modern day “Bicycle Kingdom”, as can be evidenced by these photos I took in Copenhagen streets in the fall of 2011. Those who care about politics with a worldly view would also know Denmark for its strong social welfare benefits to its citizens, similar to its Scandinavian neighbors such as Sweden and Norway. The radio program “Here and Now” recently interviewed him about his findings on societal happiness. The battles in Washington over whether to fund government programs such as unemployment benefits and healthcare –are a perennial tug of war between Republicans and Democrats. In arguments against expanding the social safety net, the argument often goes that the country is better off with a small and limited government. Benjamin Radcliff, professor of political science at the University of Notre Dame, tells Here & Now’s Meghna Chakrabarti that countries which provide ample government benefits have happier citizens. It’s HERE AND NOW. The New York Times is calling for the Obama administration to offer clemency to former NSA contractor and leaker Edward Snowden. The paper’s editorial board calls him a whistleblower and that Snowden deserves better than a life of permanent exile, fear and flight. Well, months of reporting on the NSA’s covert surveillance programs have raised important questions about big government and personal privacy. But here’s a completely different take on big government: it can make you happy. Benjamin Radcliff is a professor of political science at the University of Notre Dame and author of the book “The Political Economy of Human Happiness,” in which he says statistical analysis proves that the bigger government a country has, specifically robust social services, the happier that country’s people are. In other words, as Radcliff puts it, the nanny state works. Benjamin Radcliff joins us now. Welcome. CHAKRABARTI: So first of all, when we’re talking about happiness, what exactly do we mean? RADCLIFF: Well, by happiness we really mean a more foundational understanding of to the extent to which people actually appreciate their lives. 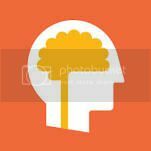 The actual survey question that most people use is actually ask people about how satisfied they are with their lives, and it is thought to get at a cognitive appreciation of the core basic idea, which is to what extent do people actually enjoy their lives. CHAKRABARTI: I suppose we could spend our entire time in this interview talking about the challenges of scientifically measuring what is essentially a fungible set of human emotions when it comes to talking about how people feel about their lives. But let’s get to your actual findings. What have you discovered about how government policies or particular government policies contribute to happiness and life satisfaction? RADCLIFF: Well, the basic idea was to test whether the two basic approaches to public policy that we have in a capitalist world, the policies of the left or the policies of the right, which or either of them seem to best contribute to people leading positive and rewarding lives. And the findings are extremely consistent across a huge range of models, which is essentially that the larger the government sector or the more generous the welfare state, the more protective labor market protections are for workers, all of these things have positive and dramatic impacts on well-being. More importantly, perhaps, those relationships hold up across social class, in other words they affect the affluent as much as the working class and the middle class. There isn’t a class bias, in effect. CHAKRABARTI: Well, tell me a little bit more about what your book says regarding why you think that these, you know, quote-unquote, “nanny state programs” or social welfare programs may actually contribute directly to people’s happiness. RADCLIFF: The background is what is our theory of what it is that causes happiness. Some economists think that improving people’s living conditions and security and so on wouldn’t matter because happiness is based on a process of social comparison with others. I’m using another theory, and the book is, in a sense, a test of this theory, called livability theory, which just simply implies the sort of common-sense view that people are happier in those societies that are more livable, that is that have a higher standard of living, which have more security, which provide people with basic human needs. That works at two levels. One is that people who receive these kinds of benefits, people who receive unemployment insurance, people who receive health care, people who receive a year or maternity leave, people who receive educational benefits, they and their families benefit directly and immediately. But more importantly, perhaps, there’s a secondary effect, which is why these programs seem to improve quality of life for everyone, which is there are ripple effects of these programs, creating a kind of shared prosperity. CHAKRABARTI: Right. Well let me ask you, it seems that other surveys really do bear out a large part of what you’re saying, that for example, and I know you’re familiar with this, the 2013 World Happiness Report that was published by the United Nations, the United States ranks, what, number 17 in that report. And basically northern European countries occupy roughly most of the top 10. So I mean, it’s not like we’re terribly unhappy because we’re not near the bottom, but maybe Americans aren’t as happy as they could be. RADCLIFF: I mean, that’s precisely the case. If you move from the least to the most generous welfare state, the impact on your life satisfaction is about twice that of, say, getting married, which is normally thought of as one of the most important determinants at the individual level of life satisfaction. So the magnitude of the effect, then, is enormous. You know, we could be a lot happier as a society if we created a northern European-style welfare state. CHAKRABARTI: But many, many people I know who are hearing this right now would say with the utmost passion that their pursuit of happiness relies on being independent of government handouts, that dependency produces unhappiness in the mind of Americans. And I’m wondering what your thought is about that perspective on happiness in the United States. RADCLIFF: Well, there’s certainly a lot to be said that – for the idea that happiness comes from freedom and the ability to pursue your own life goals. One of the control variables in my work is a measure of how individualistic a culture is, which essentially means that people are allowed to determine their own life goals and to pursue them as they see fit, and that’s one of the strongest indicators of happiness, and it’s one of the reasons why the United States scores happier than it might because we’re very high on that scale. At the same time, sometimes you need a government to help you do that. The welfare state, for instance, provides people with unemployment insurance, to take a simple example, provides people with a certain amount of freedom and security, which, you know, I find it difficult to think of as being a form of dependence. I think it’s kind of a vacuous ideological argument to think that the government providing student loans to people is somehow making them dependent on the government. CHAKRABARTI: And Professor Radcliff, has anyone ever come to you and said this smells a lot like socialism to me? RADCLIFF: The way I frame the book is with a quote from Albert Einstein, which was from an essay her wrote in 1949, in which he posed the question how would we change the structure of society if we wanted to make human life more satisfying. That’s the exact question to which the book is devoted. His answer was socialism, by which he meant the Western European social democratic model. So I guess I’m not afraid of using the word socialism. Medicare is socialism. Social Security is socialism. Plenty of people in the world think the world socialism is just a fine thing, and I suppose I’m one of those. CHAKRABARTI: I just want to ask you briefly about the subtitle of your book. 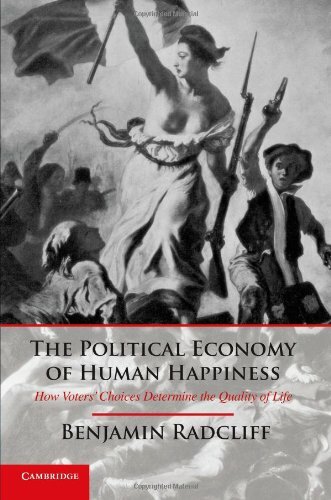 The full title is “The Political Economy of Human Happiness: How Voters’ Choices Determine the Quality of Life.” We as voters in a democracy are making choices about who represents us and the policies they enact. So in a certain degree, don’t we kind of get what we deserve by virtue of being active citizens in what is the polity of the United States? RADCLIFF: I’m not sure we get what we deserve. I wish the world worked in that way. But the subtitle I think is important in this sense. The ultimate point of the book is that there is a way to make the world a better place. It’s by changing the world to – creating the kinds of public policies that other countries, the Nordic countries that you mentioned, have championed. There is a clear path to making the world better, and we can do it if we choose to. The quality of life that we experience is not just handed out by fate. It’s within our hands to improve it if we so choose. CHAKRABARTI: Well, Benjamin Radcliff is a professor of political science at the University of Notre Dame. He’s author of “The Political Economy of Human Happiness.” Professor Radcliff, thank you so much for speaking with me today. RADCLIFF: Thank you, I enjoyed it very much. 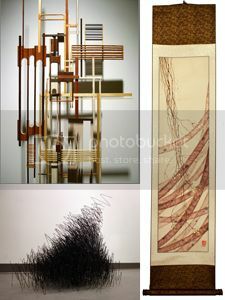 CHAKRABARTI: You’re listening to HERE AND NOW. Transcript provided by NPR, Copyright NPR.